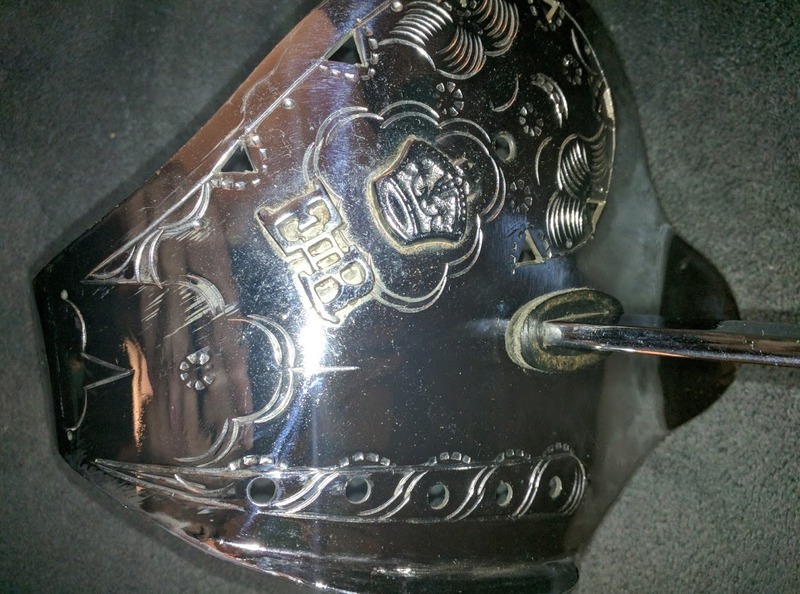 Forum Index > Historical Arms Talk > Real Or Fake Infantry Officers Sword look alike? 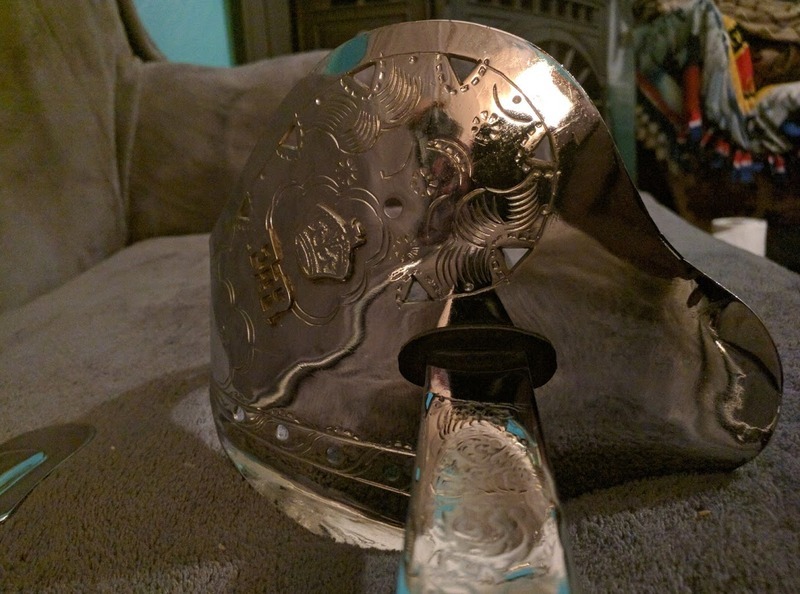 Posted: Fri 02 Dec, 2016 2:43 am Post subject: Real Or Fake Infantry Officers Sword look alike? Hi guys, newbie to collecting here, so please bear with me, and give me any guidance if need be. 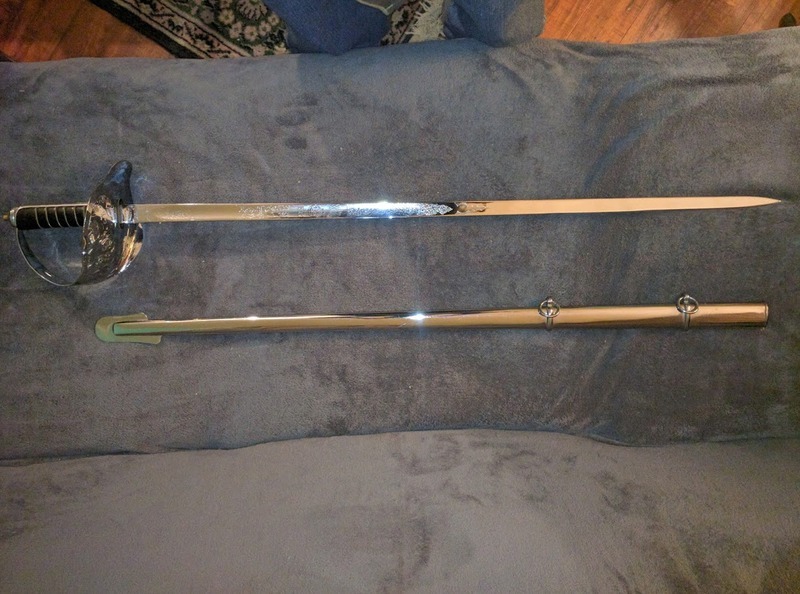 I purchased a few swords at a garage sale a couple years ago, and put them up and never bothered looking into any of them ( a couple are just really cheap replicas, so I wont waste your time with them) but one in particular has me wondering if it is just a cheap piece of wall art, or an actual officers sword. 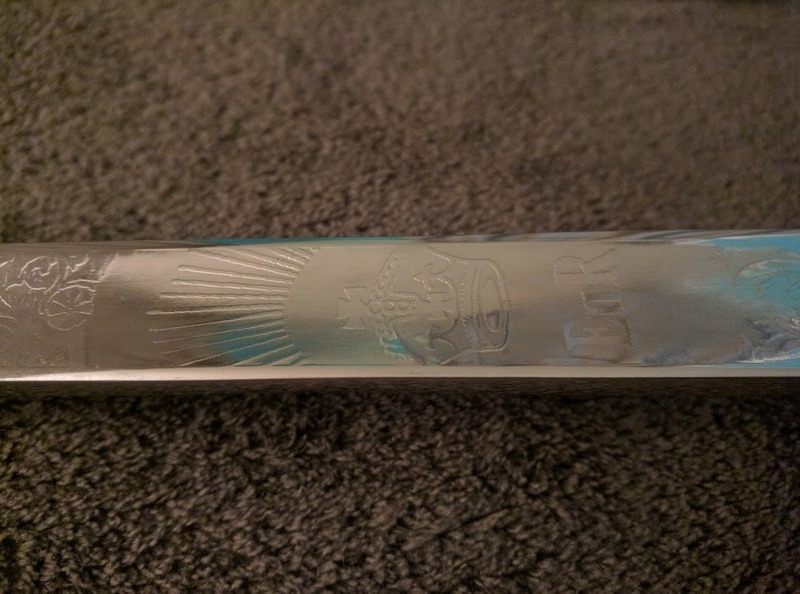 It has no serial numbers on it (that I can see) fully blunt edges, and no manufacturer label. 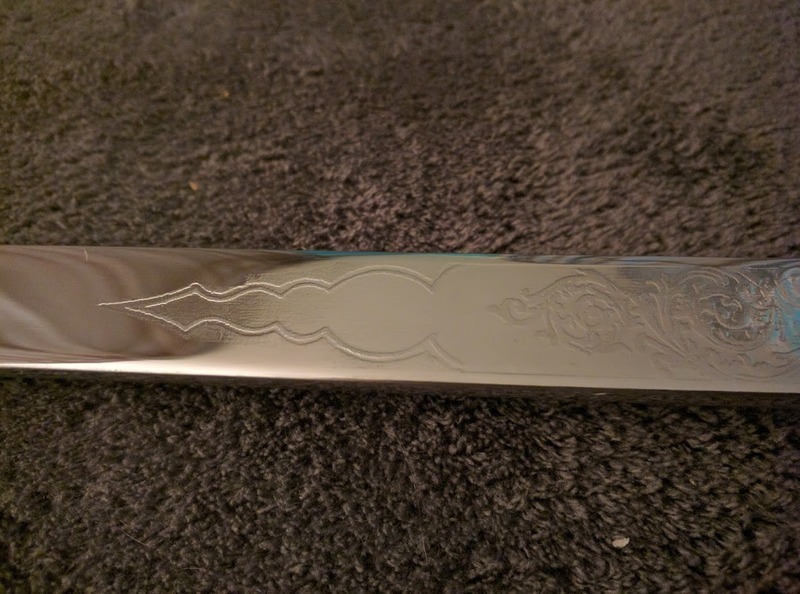 The only markings it has is "EIIR" on the both sides of the blade and once more on the hand guard. It's extremely light but very sturdy. 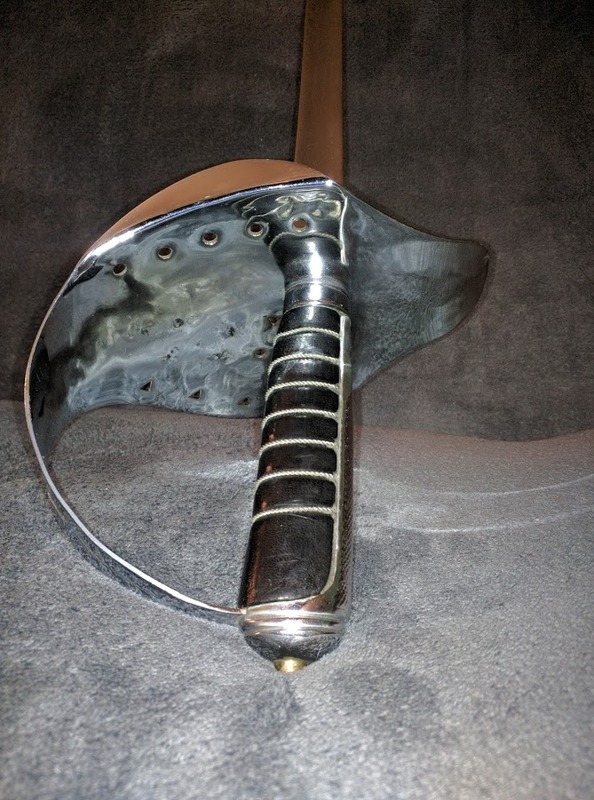 The grip on the hilt feels like a sturdy, new leather, with no heavy wear to speak of. 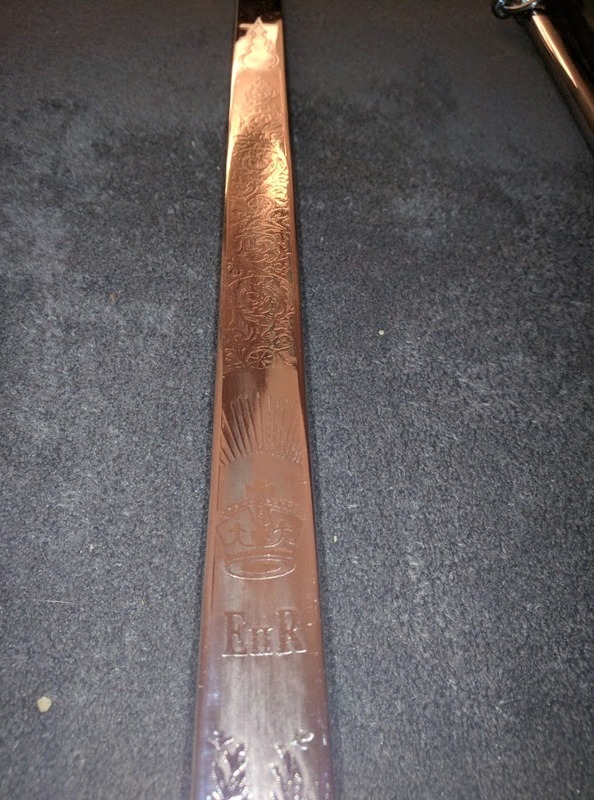 I've tried looking for info online for it, and it very closely resembles a Wilkinson 1897p infantry officers sword, but bears no Wilkinson logo, or serial number. 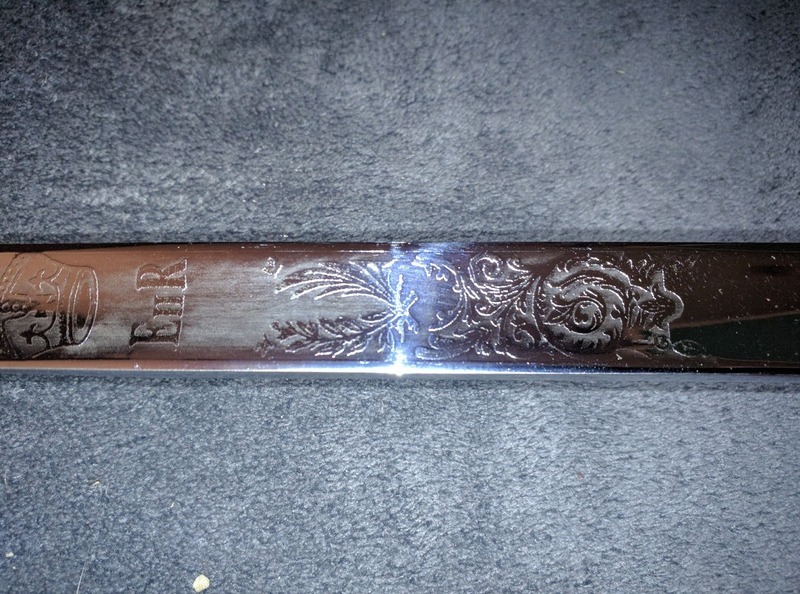 Any info on the possible origin of the blade, or any leads as to who may have manufactured it would be greatly appreciated. 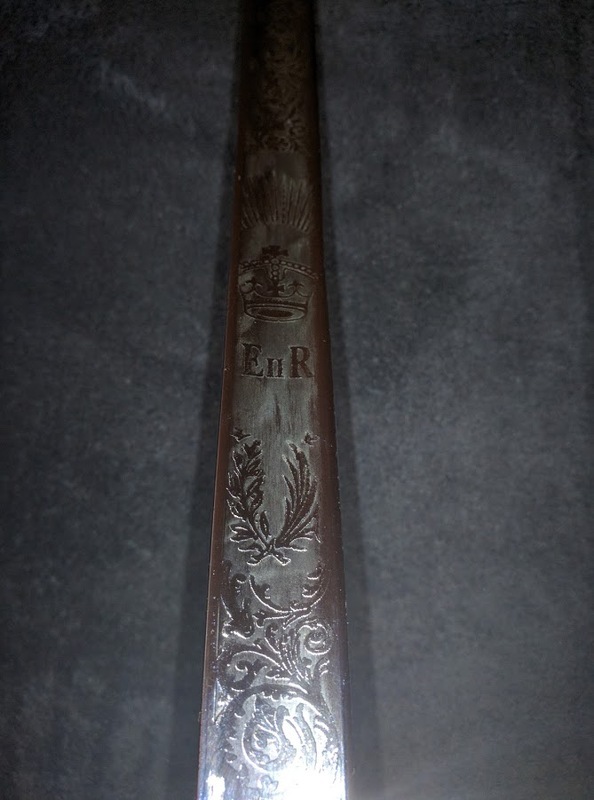 The EIIR on the blade is the royal cypher of Elizabeth II Regina . . . the current Queen of England. 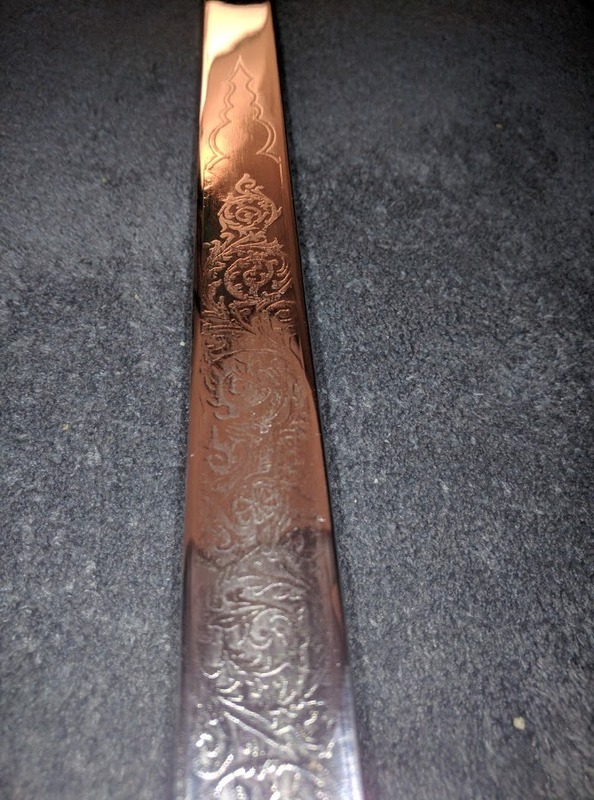 The fact that it has no makers marks or serial number screams that it's a fake/knock-off/reproduction or whatever similar term you'd like to use. Don't get me wrong, it's a nice looking and apparently solidly built reproduction piece. 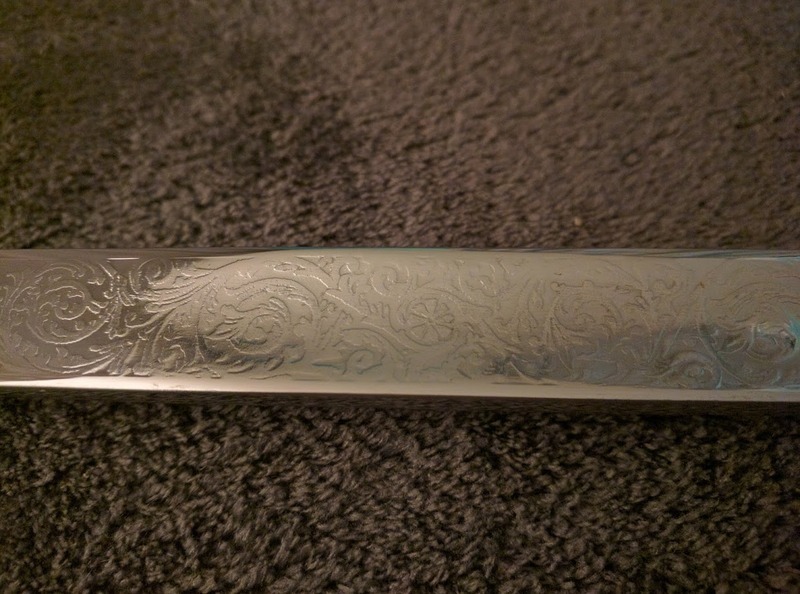 It was possibly for use as a parade sword, reenactment piece, or just a display piece. 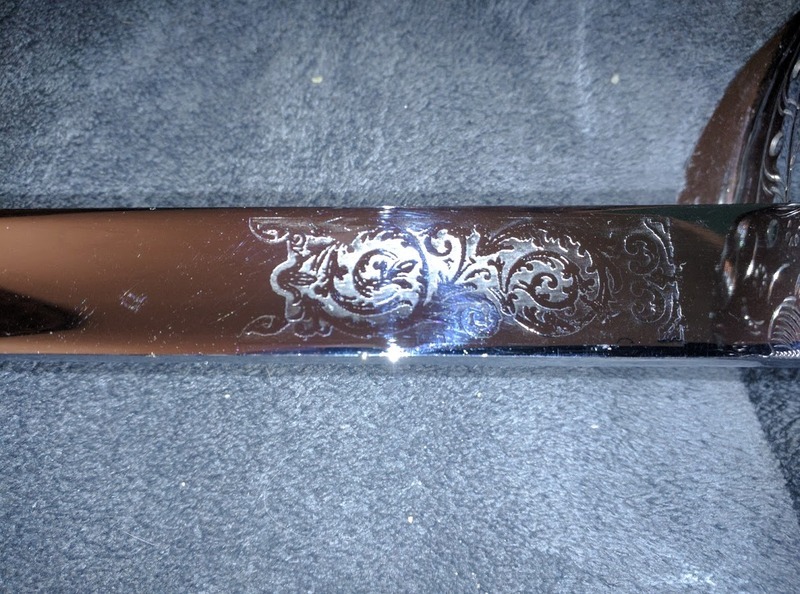 I certainly wouldn't try to sharpen it and use it for any cutting, however, because it looks like it's all stainless steel. To quote yourself, it's probably "just a cheap piece of wall art". It's just wall art that could possibly be pulled down and worn for some sort of reenactment or costume piece for some British officer's uniform. 1. 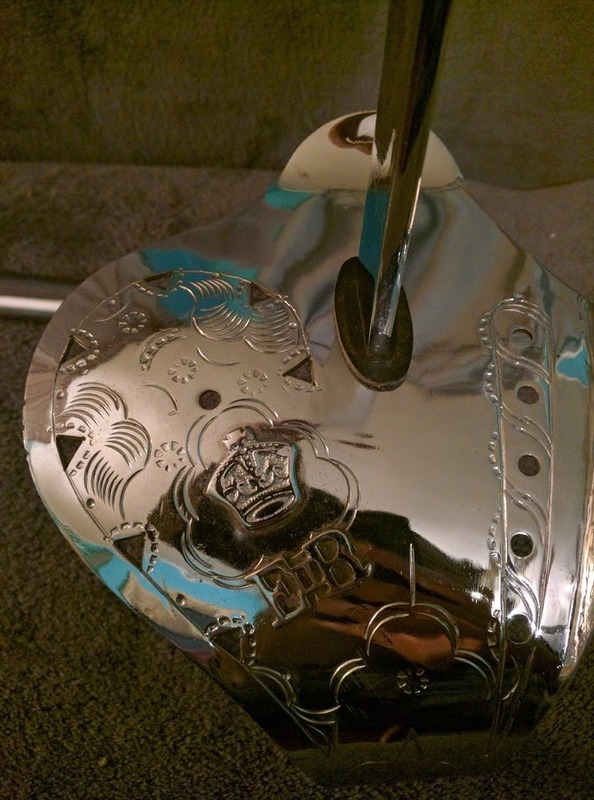 Wrong crown in the cyper. It should be St. Edward's Crown not the Tudor Crown. 2. 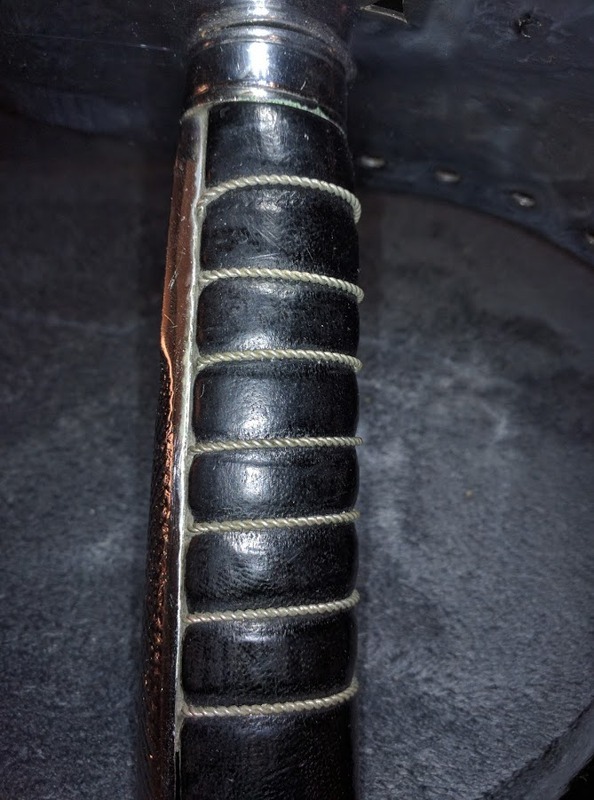 Grip should be shagreen (fish skin) not leather. 3. Grip wires should be braided not a simple twist wire. 6. 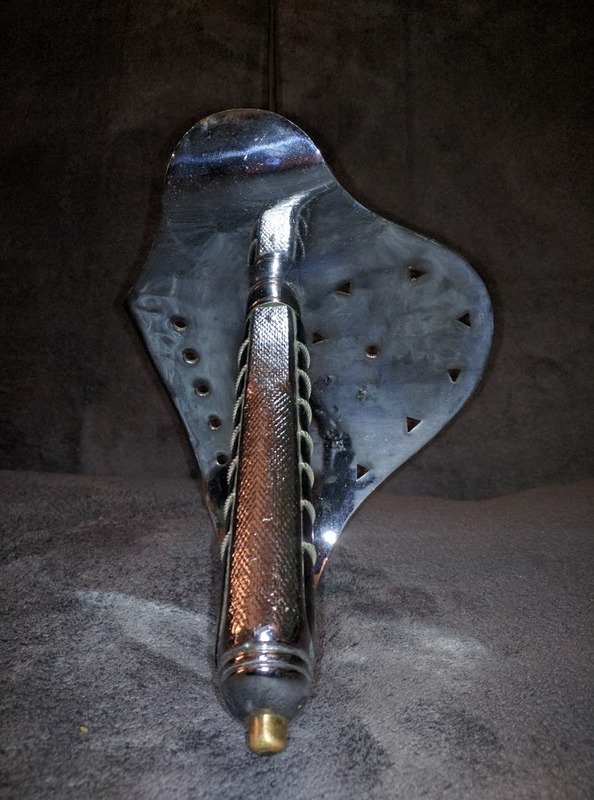 Poor quality piercings on the hilt and not the correct pattern. 7. Grip collet should be ribbed. Stick it on a wall and then move house. Awesome replies guys, thank you so much! I saw there were a lot of discrepancies between this and the real thing, and I pretty much came tot he same conclusion myself, but couldn't be sure until I found a panel of experts like you all! At least now I know some cool little facts about these swords. Thank you all so much once again!